Are your taxes done? Oh don’t give me that look, you know exactly when they are due…so get to crunching those numbers!! LOL I am just kidding, mine are not done either. I decided to make Homemade Pepperoni Pizza instead of frying anymore brain cells searching for deductions that I may have missed. There are always more, right? What is in a Homemade Pepperoni Pizza? 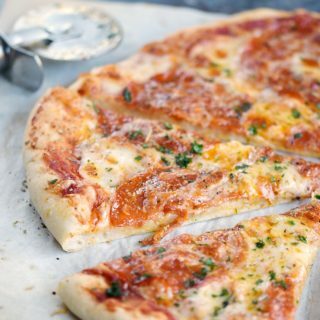 Pizza Dough, Pizza Sauce, Mozzarella Cheese, Pepperoni, Parmesan Cheese, and Italian Seasoning are the basic ingredients. Mozzarella Cheese is can be tricky. The fresh packed in water version is delicious, but has a bit too much moisture. 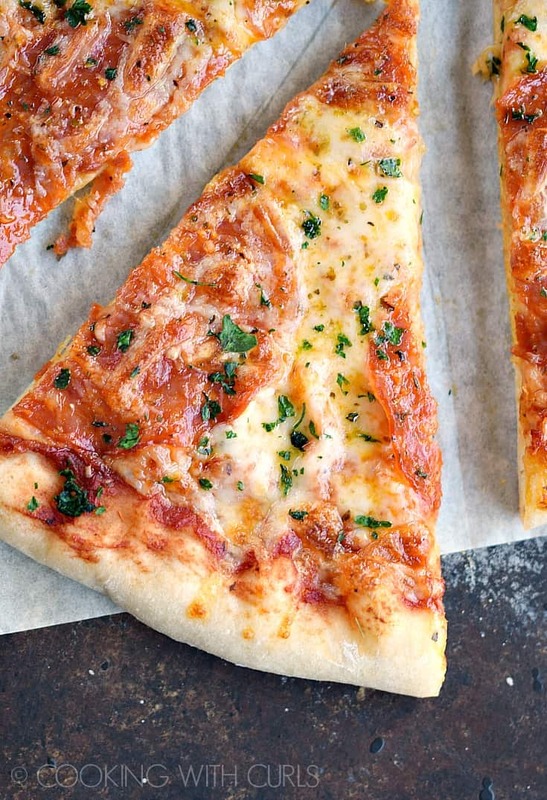 The pre-shredded in a package cheese is coated with flour or cornstarch which affects the final flavor of your pizza. I really like the Galbani ball of part-skim mozzarella for pizza. It is firm enough to grate, but it also melts really well. Pepperoni, the star of the show. I use Applegate Naturals Un-cured pepperoni. It comes in big slices, not the little rounds that you are used to seeing. I sometimes cut them into wedges to make them easier to eat. Parmigiano-Reggiano is my favorite Parmesan cheese! Asiago is more widely available and still quite delicious. Please, please do not use that stuff in the green can!! How do you make a Homemade Pepperoni Pizza? If using homemade dough, it is best to make it a day or two in advance and store it in the refrigerator until ready to use. 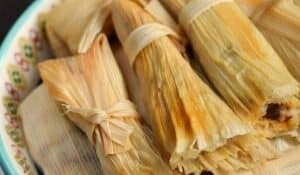 This allows the gluten to rest and the flavors to develop. Place dough on a floured work surface and roll or stretch into a 11 to 12-inch circle. Place dough circle on a sheet of parchment paper….. 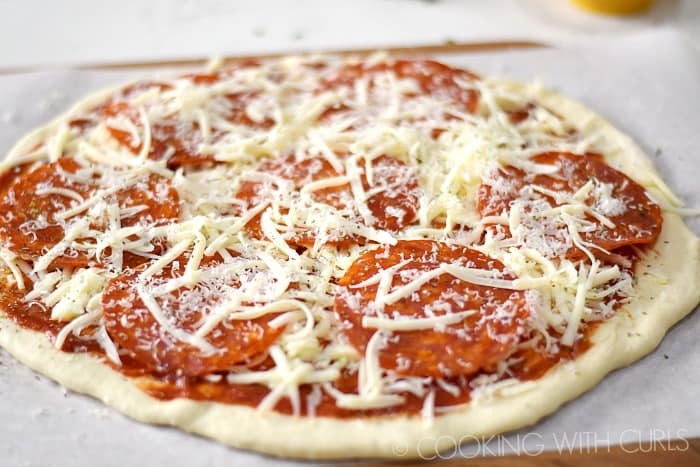 Spread the pizza sauce on top of the dough with a large spoon leaving a clean edge around the perimeter…..
Sprinkle 3/4th’s the grated mozzarella over the sauce, again leaving a clean edge…..
Place your pepperoni rounds on top of the cheese. Sprinkle with the remaining mozzarella, the finely grated Parmesan and the Italian seasoning….. 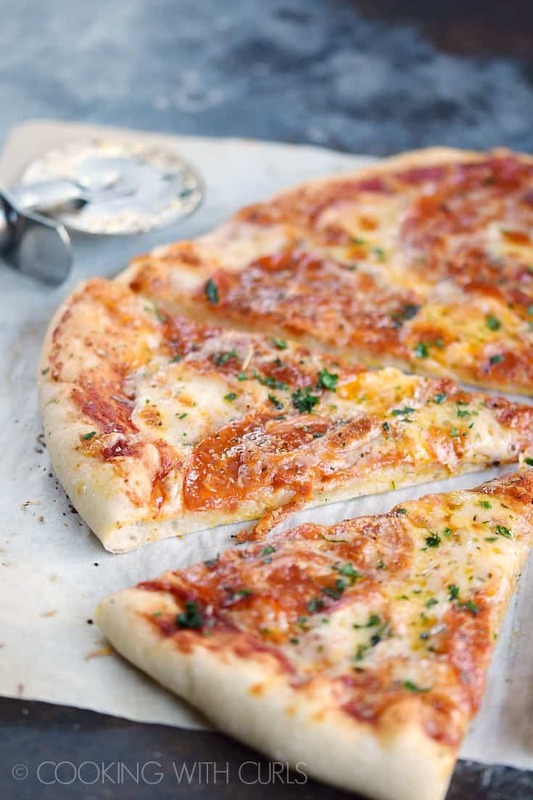 Carefully slide the pizza and the parchment paper onto the preheated pizza stone. Bake until the cheese is melted and bubbly, 6 to 8 minutes. Remove from the oven and allow to rest for five minutes before slicing…..
All ovens are different, your cooking time may vary. If you are not using a Baking/Pizza Stone, substitute a pizza pan or a large Un-rimmed Baking Sheet. You can also turn the un-rimmed baking sheet upside down and use it as a Pizza Peel. 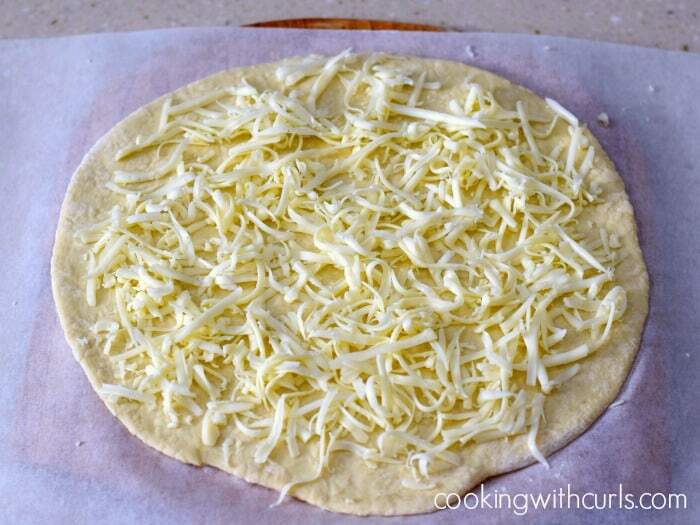 For added flavor, use a mixture of grated cheeses…such as Fontina, Gouda, Romano, etc. I place the pepperoni on top of the cheese to give the pepperoni a chance to get a bit crispy on the edges. Feel free to put the pepperoni on the bottom if you prefer. If you look at the two “old” images that I used above, you will notice that the pizza dough is flatter than the newest images. I used the same recipe, the difference is refrigerating the dough which makes it puffier and the finished pizza has a chewier texture. Do not cut your pizza on the pizza peel!! Doing so will damage the surface and make it harder to slide into the oven. This Homemade Pepperoni Pizza was better tasting that most pizzas that I have ordered in restaurants, and definitely better than any pizza that comes out of a box! Eggs Benedict Pizza – breakfast, brunch, even dinner! Steakhouse Pizza – with white pizza sauce, sliced steak, crispy onion rings, and Gorgonzola butter! Shrimp Scampi Pizza – one of the most popular recipes on Cooking with Curls! 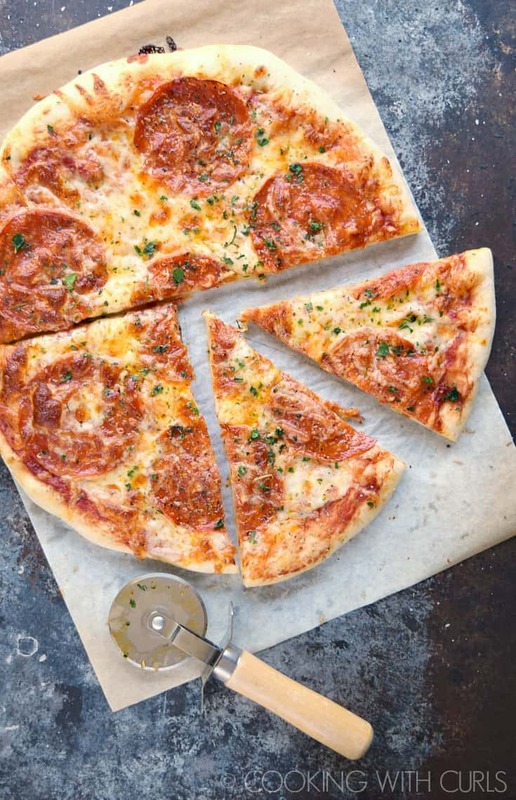 Homemade Pepperoni Pizza is a family favorite, and easy enough for the kids to make themselves! 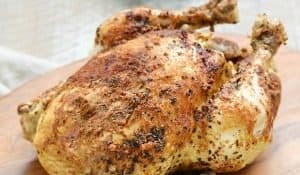 Step-by-step instructions to make from scratch or use a few shortcuts. Place dough on a floured work surface and roll or stretch into a 11 to 12-inch circle. 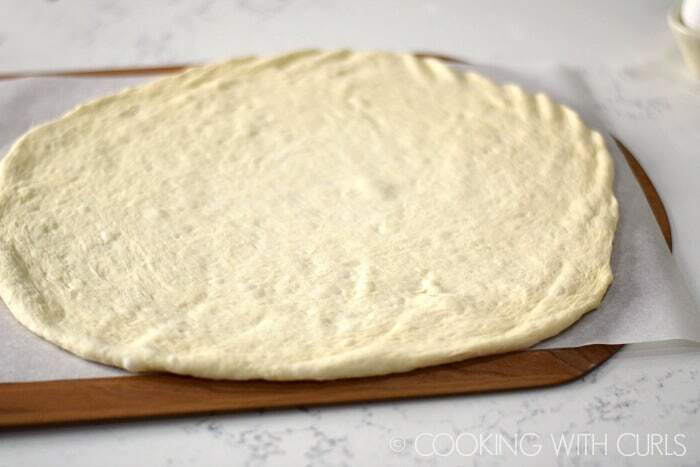 Place dough circle on a sheet of parchment paper. 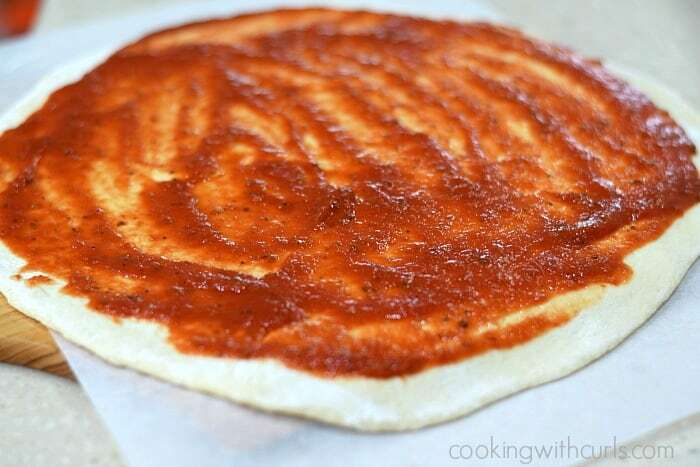 Spread the pizza sauce on top of the dough with a large spoon leaving a clean edge around the perimeter. Sprinkle 3/4th’s the grated mozzarella over the sauce, again leaving a clean edge. Place your pepperoni slices on top of the cheese. Sprinkle with the remaining mozzarella, the finely grated Parmesan and the Italian seasoning. Remove from the oven and allow to rest for five minutes before slicing. Sprinkle chopped, fresh Italian parsley over the pizza before serving...for added color. That looks amazing, my mouth is watering. Def going to try this out! I want a slice of this pizza! 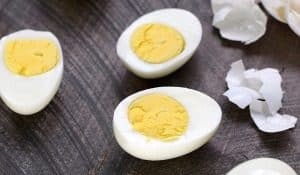 Pinned your recipe. Thanks for linking up with us a the #HomeMattersParty this week!